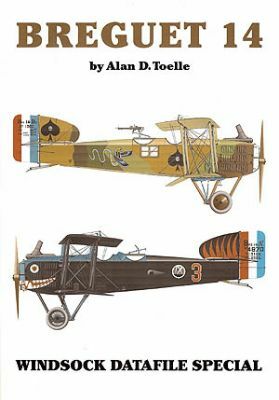 AMERICAN historian Alan D Toelle is a leading authority on WWI aviation,especially concerning French colours and markings where his pioneering research on 'Project Butterfly' for Cross and Cockade earned him well-deserved plaudits.Alan's extensive knowledge of the subject and an exacting artistic flair have been melded seamlessly for his first book, a heavily- illustrated monograph on the Breguet 14, that versatile French two-seater which equipped many French and US units on the Western Front and several post-war air forces. In over 80 pages the author presents unparalleled and authentic coverage:Operations;Production;Manufacturers' hallmarks;Armament;Ordnance;Structure;Engines;Cowling variations;Stencil data and rudder typography.Detailed colours and markings sections are supported by 12 pages of Alan's own stunning and hyper-accurate colour plates depicting over 30 different Breguets from Belgium,France,Finland, Czechoslovakia,and in USAS service. There are planforms showing camouflage patterns and national markings;radiator variables,unit insignia-even bombs and bomb racks!140 photos,most published here for the first time,contemporary ordnance drawings,exhaustive tabular data and records combine to present the ultimate reference-the finest ever published on this classic and enigmatic warplane.